It popped up like an astonishing flower out of place. Turn a corner in the drugstore and it’s unexpectedly crouched there in the aisle. It’s draped in a shop window with a possessive air. It’s threaded through television ads. And pretty soon you resign yourself to its pervasive arrival. The holiday season is here. You can dismiss it as a silly frivolity amid much more important and pressing concerns of the day. Or perhaps you greet it with relief, a chance to remember home and family, familiarity when all the world feels strange and forbidding. No matter if it fills with you joy or with dread, the holidays have a real impact on body and spirit. A focus on self-care can help you coast through whatever conditions this time of year bring you. Seasonally, Autumn is the time of year for pulling in your harvest, assessing the riches born of a year’s work, lavishing in abundance to share with your community and family. What was once a rare feasting time supplied by the organic miracles gifted by the land has become, for some, an exhausting marathon of meals with dubious ingredients and heaps of excess. It’s excess sugar, excess oils, excess refined salt and grains, and excessive portions. And just one more cookie. You definitely deserve to celebrate, let down your discipline a little, kick back with a cup of good cheer, laugh with your friends, embrace those you love. And if you’re heaping a little more on your plate, either literally or figuratively, remember that it is temporary and do what you can to mitigate any of the negative effects. Here are the top five self-care practices that can bring you relief and rejuvenation at this time of year. This is the basis for good health. Your body is mostly water and all systems rely on the delicate balance of fluids in order to function optimally. Late fall and winter are naturally drying times, so it’s vital to make sure you are hydrating properly. It’s not just drinking bottles of water. 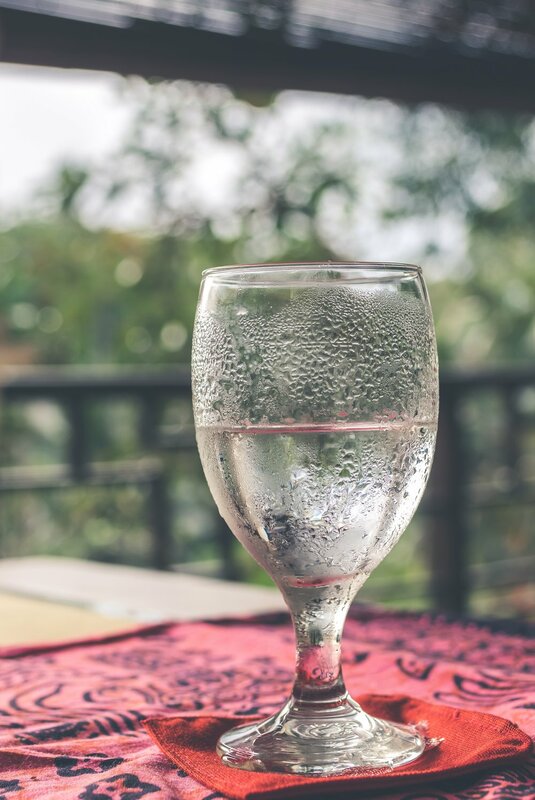 The dhyana Center founder, DeAnna Batdorff, talks about the Trine of Hydration, a three-fold process to ensure the water that’s brought into the body doesn’t just empty into the bladder without absorption into the cells. This trine is essential fatty acids (EFAs), electrolytes, and probiotics. Probiotics ensure that the digestive system has the right biome to process food and beverages fully, pulling out water from anything you eat and drink. Water isn’t much without electrolytes, the minerals that provide necessary replenishment to those lost in everyday activity, exercise, and normal body processes. And, finally, essential fatty acids, also known as omega oils, help cells absorb and hold water. Keep this trine in place by adding raw omega oils to salads and soups (try hemp or flax oils!). Probiotics work best when found within fermented foods -- yogurt, kefir, raw apple cider vinegar, or krauts. Add good unrefined salt by the pinch to your bottle of water. The dhyana Center offers ethically sourced Atlantic grey salt, the finest everyday salt rich in magnesium. Find ways to keep moving. Studies show that regular, day-long movement is healthier than a quick 30 minutes at the gym sandwiched between sitting at a desk and sitting on the couch. A regular yoga class can provide movement, a chance to slow down the mind, and a stretch for tight muscles that are compressed and shortened by the habits of modern life. Some classes, like Naam or Kundalini yoga, work on subtle energy within, often leaving you energized and revived with optimism. Hatha yoga and flow classes increase circulation, invigorate muscles, and bring you back to your breath. These practices not only give you the immediate benefits of movement and meditation during your time in the class, but can provide tools to take with you in stressful moments. Regular movement also benefits your lymphatic system, which is the body process that supports your immunity and cleanses toxins. While your bloodstream moves on its own, the lymphatic system moves only through muscle activation. So regular movement keeps your system clean. Consider trying one of the many yoga classes the dhyana Center offers to get your essential holiday movement among new friends. This Sanskrit term refers to the act of massaging warm oil into your skin and is a must in wintertime. As holiday visits and cross-country traveling in cold weather bring you into and out of heated spaces, your skin and consequently your entire body bear the wear of this drying time. Take time for yourself to replenish your body’s largest organ, the skin, with regular self-massage using high-quality oils. One of the top oils the dhyana Center offers is called Mahanarayan, an oil imported from India that is suffused with traditional ayurvedic herbs which provide warmth and stimulate circulation. Abhyanga is best done in a dry bathtub or shower, standing on a wet washcloth to prevent slipping. Slather your skin with enough oil to feel moisturized, massaging your limbs as you work. This is a good gift for your body after your morning shower. Give yourself extra time to enjoy your massage, the chance to reconnect with your body as it works hard carrying you through your daily to-do lists. Make this physical connection time a weekly appointment that you honor just for yourself. It’s difficult to avoid rich food at the holidays. Even if every dish you encounter is made from whole, unprocessed, and organic ingredients, you may find your body expressing discomfort if you’re indulging a bit more than usual in this festive time. Fermented foods give your digestive system extra power to process all the food you eat and keep everything moving through smoothly. Ferments include raw sauerkraut (in a rainbow of flavors and varieties these days), kefir, kombucha, apple cider vinegar, and yogurt. Ferments are particularly useful when you know you’ll be eating a lot of meat and carbohydrates -- hello turkey, stuffing, and mashed potatoes. So add a portion of kraut onto your dinner plate or sip a bottle of kombucha after your meal and feel the difference. Tis the season for coughs and sniffles. Protect and fortify your lungs by regularly employing steam. Whether you’re relaxing for 15 minutes in the dhyana Center steam room or preparing a home steam with herbs in a pot of steaming water on your kitchen table, steam can deliver herbal medicine into your bloodstream through the lungs and skin pores to relax your nervous system and bring moisture and hydration into your body. It also invites sweating, which helps ferry toxins out of the body through the skin and rev up your circulation as the body works to keep cool. Notice how quickly you relax entering a steam room and you’ll want to keep this tool in regular use. At the dhyana Center, Rachel, our medicine-maker, has cleverly created a steam tablet with immunity-boosting herbs that you can easily add to your daily shower. It’s such a simple way to keep your system running at tip-top shape through the holidays. As strange as it may sound, caring for yourself can be one of the most challenging aspects to daily living. But it’s a challenge worth taking on, and particularly this time of year. That’s why the dhyana Center is committed to supporting your well-being and encouraging your self-care practice. With this sacred time taken for yourself, you may find you have more to give and more to enjoy as the holidays unfold. Watch for our next edition of the Self-Care Holiday Survival Guide, coming soon!